"adventure, fantasy, steampunk, reincarnation, coming of age"
Reformat is an adventure of how a 21st century academic, reincarnated with his memories, transforms a primitive land. The story starts with the protagonist, Nicholas King, enjoying his newly established career as an academic. His successful career however is cut short as one of the warring nations of the world drops a nuke into his city, killing him. As a result, he is reborn in the River Kingdom, but with a gift-his memories are intact. There he restarts life as the young Linus Daedalus, of whom many consider a genius, yet for the cautious, suspicious. Given ordinary circumstances, reliving life is a piece of cake for our academic, but in the barbaric and uncivilized world of the River Kingdom, how will he play his cards out? Find out by reading more of Linus Daedalus' adventures in Reformat. 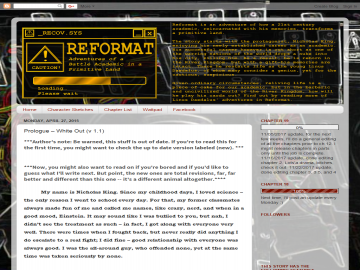 Reformat: Adventures of a Battle Academic in a Primitive Land has not been tagged yet. Help others find Reformat: Adventures of a Battle Academic in a Primitive Land by tagging it! Reformat: Adventures of a Battle Academic in a Primitive Land has not been reviewed yet. Reformat: Adventures of a Battle Academic in a Primitive Land has not been recommended yet.